GOP Leader Resigns After Tweeting "It's Time for Another Kent State"
GOP Leader Forced to Resign After Tweeting "It's Time for Another Kent State"
Secretary of the Marquette County Republican Party in Michigan, Dan Adamini, made a series of social media posts implying that protesters, like the ones at a university in California last week, should be shot as they were during the Kent State Massacre. 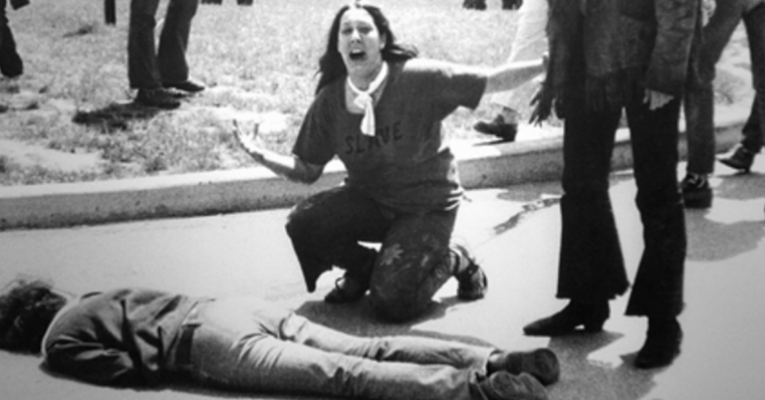 In 1970, the Ohio National Guard killed four students and injured nine others after they were ordered to use live ammunition during protests against the Vietnam War at Ohio’s Kent State University. Adamini then gave his post more thought and reworded it for Facebook. His second post still called for violence and evoked the Kent State shootings. “The violent protests at our universities certainly indicate Portage acacian at the lower level. I’m thinking another Kent State might be the only solution. Protest stopped after only one death. They do it because they know there are no consequences yet,” Adamini said. In an interview with Free Press, Adamini apologized, saying he was actually intending to stop violence with his posts rather than incite it. In other words, Adamini was trying to make threats so protesters would submit out of fear of being shot, as students have been in the past. “It was stupid, it was poorly done. But my goal was to stop the violence by protesters, not commit violence against protesters. The point I was trying to make, admittedly I did it very poorly … was that the violence is really getting out of hand, and much like in the 1960s, the violence created an atmosphere where something terrible and tragic like Kent State could happen. I’d like to see the violence stop before we have a tragedy,” Adamini said. “We could be headed toward another Kent State tragedy if we don’t get a handle on the violence. It sounds like I was calling for violence, but I was actually trying to call for an end to the violence. … Some are saying I’m calling for the death of innocent protesters, but nothing could be further from the truth. There are paid agitators who continue to plague this country,” he added. Adamani’s statements were condemned by both Democrats and Republicans, and he was quickly forced to resign. However, Adamani blamed his critics for his resignation and claimed that he received death threats after news of his posts went viral. Adamini’s talk radio show In the Right Mind has been suspended for at least the rest of the month.